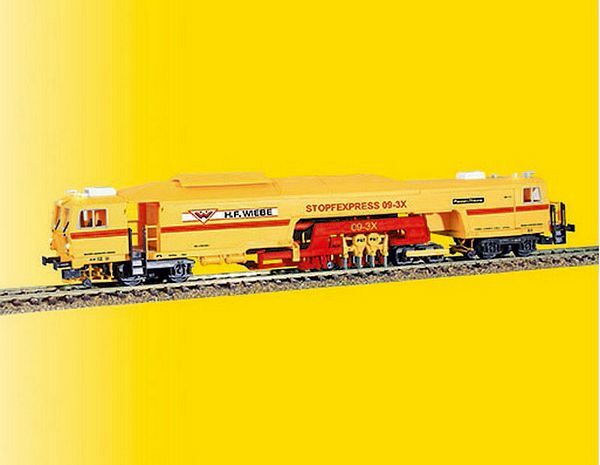 Tamping machine for ballast renewal from Plasser & Theurer. Lighting functions: Directional headlights (three white headlights) red tail lights, yellow warning beacons as well as whilte lighting of the working room. Integrated sound module offers sounds of horn and additional suitable noises. With drive unit, LED-flashlights and equipped with decoder suitable for DCC, Motorola and RailCom. Smooth movement forward and reverse of the loco due to powerful drive unit. In a special work mode the locomotive is moving slowly forwards, with a working tamping unit. Analogue function range: work mode forward/reverse, work mode with functional tamping unit incl. lighting (warning flasher, working light) reachable, sound active (adjustable volume with a potentiometer), light active. Digital function range: work mode forward/reverse, switchable functions: working mode (slide- and tamping movement also individually switchable), warning flasher, working light, (adjustable volume by CV), horn, lighting. With close-coupling kinematics acc. NEM 362 at both ends, dummy of coupling and standard delivered system coupling shaft.